Here is a string alignment check that will check both your frame and fork without dismantling the bike. I must warn you that this is a little tedious to set up; I did it on my own but it would be easier with the help of a second person. Not your wife, if you want to stay married. Turn the bike upside down and rest the handlebars on two wooden blocks or stacks of books of equal height. 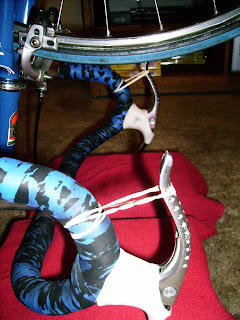 Squeeze the brake levers and secure them with rubber bands as shown. This will hold the wheels to stop them spinning, but still allow you to rotate them. Measure the height of the bottom bracket shell from the ground. Now rotate the wheels so the valve stems are one inch higher than the bottom bracket front and rear wheel, and positioned at the extremities of the bike. This will be your guide to where you will place the string. 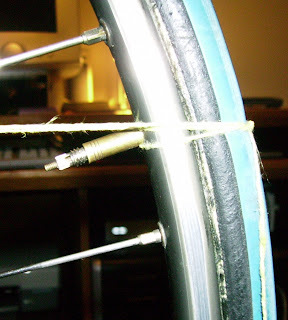 Using a piece of string long enough to reach the length of the bike and back again; start at the back wheel valve stem and thread the string inside the spokes of both wheels. 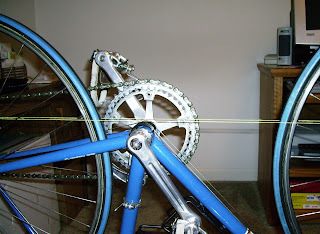 Tie a loop in the string at the front tire and repeat with the other end of the string from the back to the front on the opposite side of the bike. Pull the string tight. 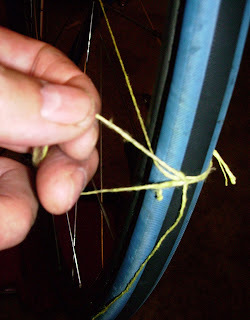 Make a loop at the front tire and pass it through the first loop you tied on the end of the string. Pass this loop over the front valve stem and pull tight; this will hold it in place. Now here is the tedious part; if the sting is touching a spoke, you are going to have to untie and rethread the string. Mostly you will be inside the spokes, but in some places where the string passes a spoke near the rim, you may need to be outside the spoke. You can turn the front wheel (Steering.) until the string is touching the tire in four places each wheel, but touching nothing else. 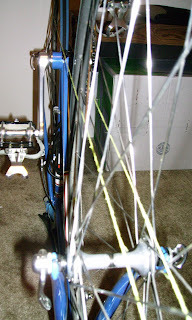 The double string should be in the center of the bottom bracket shell, (See top Picture.) but more importantly be in the center of the down tube. A BB shell can be machined unequally, but if the wheels are central the main tubes, the frame is straight. If your bike rides fine I wouldn’t even go to the trouble of doing this test. However, if you suspect something is off, this test will show it up. Sometimes in a crash, the front wheel will turn 90 degrees to the frame and the rider is thrown over the handlebars. In this case the front fork can be pushed slightly sideways, and the wheels will not be in the same plane. Tolerances: I would expect the string to be within 1 mm. of the tire at any point, with the wheel central between the chainstays. My thanks to Bill Talbot for suggesting this topic.